On our tours, we always take a shot in front of the resort welcome sign. We are not alone as this is definitely one of the top photo types one sees posted online. The literally iconic “W” of the iconic W Retreat is not only probably the most popular logo shot in the Maldives (at least judging by Instagram posts – see bottom photo for example), but the resort generously lends a hand. The minute you step on the jetty, they take the shot for you and by the time you have checked-in and made it to your room, a framed photo of your arrival is waiting for you at the room (see ours below). As with so many touches, the W takes this feature a step further…or should we say deeper. 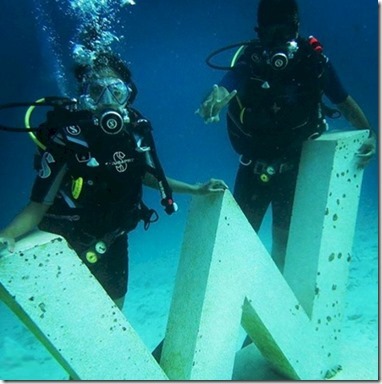 They have submerged a “W” in their lagoon for underwater photos. Not quite the underwater sculpture garden I “haven’t seen yet”, but along the same lines. W would win world water witness with wonderful water wrinkle we want.